As you step up to Casa Bonita, you are taken back through the gorgeous European-inspired interiors that Casa Bonita is one of the newer luxury rentals in the exclusive Palmilla Cove and it offers its guests incredible access to the private beach on the Sea of Cortez, gorgeous golfing, and the entertaining nightlife of San Jose del Cabo. The villa boasts a beautiful large pool with four fabulous bedrooms, creating enough room for a party of ten. 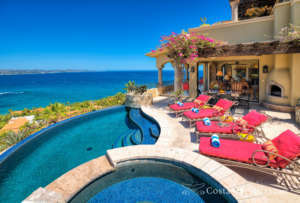 The absolute jewel of Casa Bonita is the infinity pool which features a swim-up bar at one end and a hot tub on the other. The terrace is aligned with a lounge chairs that opens up to another open are area that features an outdoor fireplace for lounging under the stars or enjoy a dinner al-fresco with the outdoor kitchen. Imagine dancing under the moonlight with the outdoor sound system or perhaps catching a movie by the waves with the outdoor TV. For many people, simply sitting in the courtyard by the soothing sounds of trickling water is more than enough to relax. The interior of the villa creates a feeling if vacationing in an exquisite Tuscan estate. The villa is able to combine new and traditional throughout decor aspects starting with the gorgeous carved mantel to a fully equipped modern kitchen. If you are looking to enjoy a full no worries vacation, you may wish to take advantage of the chef service that is available at an extra charge. 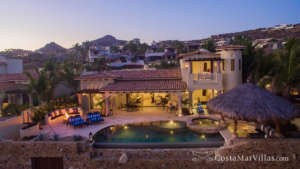 The villa includes three ocean view bedrooms in the main house, while the casita includes one bathroom, all have a full bathroom. The main villa includes two king size bedrooms and an al-fresco shower with hot tub access, while the other includes two queen beds. The casita offers a king size bedroom. Cabo San Lucas offer perfect weather, great beaches and a wonderful atmosphere, all of which makes this the perfect location for golf, honeymoons, and of course, weddings. The villa is just a minutes walk from Palmilla Beach, however, you can make the 16-mile drive to the gorgeous Medano Beach. If you are an avid golfer, take note to book a tee time at the Palmilla course, while the shopper will want to spend an afternoon at Puerto Paraiso. An evening would not be complete without dining and dancing at San Jose del Cabo or Cabo San Lucas. One vacation here is going to make this a favorite destination. In fact, you may never want to vacation anywhere else again. If nothing else, you will more than likely be back on a yearly basis to see old friends and make new ones. Now the waters from the Sea of Cortez are calling you, don’t make them wait any longer!